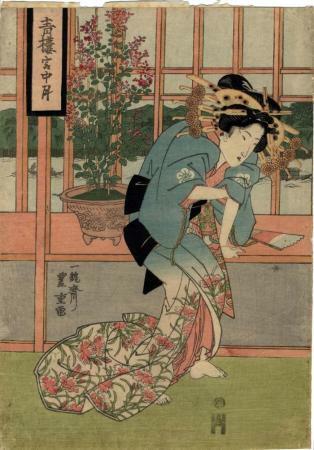 The courtesan in the picture is wearing a robe decorated with dianthus flowers which are also called pinks, but the Japanese word is nadeshiko (撫子). It is considered one of the Seven Flowers of Autumn. If Andreas Marks dates for the publisher of this print, Imariya Ushizō, ca. 1816-1827, then the date of this image can be no later than that end date.